Far too many of us take our noses for granted when it comes to whisky. I can promise that you will never really know a whisky without using your nose. The general consensus (in Western thought, anyway), is that man is able to identify four distinct taste sensations. Referred to as ‘primaries’, these sensations are sweet, salty, sour and bitter. 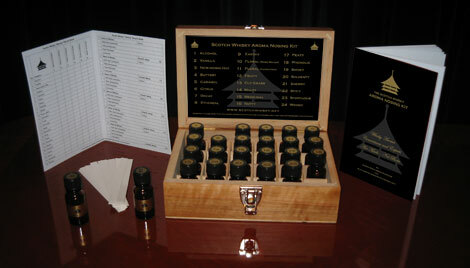 On the other hand, there are 32 primary aromas. Can you imagine what you are missing out on by not utilizing your nose? Some studies indicate that as much as 90% of taste is actually smell. The classic test? Plug your nose while eating something. Charles MacLean (whisky guru) went so far as to say that “The taste buds are of secondary importance when it comes to the sensory evaluation of any whisky”. First things first…set yourself up with the proper glassware. Any nosing glass, and therefore any whisky glass in my opinion, should be tulip shaped. 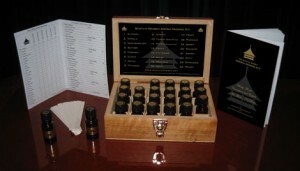 This allows the natural curve of the glass to funnel aroma out the top in a pyramid of scent. Ideally, of course, into your awaiting nose. I am personally a hopeless appreciator of the Glencairn Glass. It is the perfect marriage of form, function and aesthetics. The small aperture ensures that all scent is directed to your nose without allowing room for any to escape. The bowl is wide in order to allow the whisky to open and be seen in all its glory, and the solid base helps this beautiful crystal glass feel comfortable in hand. You will also need water. Nothing carbonated, chilled, flavored or impure. A bottle of something filtered, kept at room temperature is ideal. Ice? Never. I won’t say you shouldn’t add ice to your whisky (uh…yes, I will…but that is another discussion), but at the very least, do not add ice to your whisky when nosing or tasting. Ice will only serve to close up the whisky and prevent all of the aromatic diffusion necessary for the exercise. Finally, you’ll need a straw or spoon, or something along those lines that will allow you to add water to your glass drops at a time. Pour a measure in your glass. Sit back for a couple of minutes and allow the whisky to open. Remember…this whisky which was once in a breathable cask has been bottled up for some time now. Let it breathe. The profile will change dramatically. With mouth slightly open, and nose an inch or so away from the rim of the glass, inhale gently. Do this a couple of times and note what it smells like…first impression…no over-thinking. Sweet? Smoky? Next put your nose in the glass and inhale deeply. Try to hold that scent. Is there any more you can distinguish? Think about whether or not it conjures a familiar memory to you. From there you may realize that this memory tells you what the scent familiarity is. An example: The whisky reminds you of Christmas fruitcake. What is fruitcake made of? Raisins? Figs? Rum? Cherries? Are any of these distinct in what you have just smelled? Do not doubt your first impression. Often times we will confuse ourselves and start second-guessing our noses. This could just be because we are drowning our sense with the alcohol itself. A tip I recently read, and now adhere to: When you feel like you’ve been scent-logged and your nose be biased (or anaesthetized), inhale deeply with your nose pressed against your hand or your arm. It seems to neutralize the effect of the overpowering alcohol you’ve had your nose buried in. Your next inhalation from the glass will seem fresh again. Go slow and start by pulling out the big easy notes like peat…smoke…fruit…vanilla…oak. These should come fairly easily, though do not be discouraged if you’re not picking these out immediately. From here, you may be able to take it further. You’ll start to understand what that sweet background is (or reminds you of). Spice will no longer suffice; it will become nutmeg, cinnamon, coriander. Fruit will start to smell green (!!) or citrus-y or even dried. Wood will stop being wood, and will instead become ‘bourbon cask’ or ‘oloroso cask’, or hints of cedar. I’m sure you get the picture. The point is…start slow. Take notes. Nosing is all about practice and familiarizing. Now try to hunt down a few reviews of the whisky you’re nosing. Are others picking up what you are? Are you picking up what they are? The neat thing is…neither is right or wrong. Jonathan Bray once said at a tasting, “if you smell it, it’s there”. In reality, all you are smelling is a barley distillate aged in wood. Perhaps smoke. All of the notes that we pick up on are ghost notes. There is no actual citrus added. There is no vanilla, leather, toffee or salt either. These are just the scents that the brain associates. Now…add a few drops of water (be a little more generous when adding water to cask strength whiskies, but still take it slowly). Be cautious not to drown your dram. A few drops at a time is the best way to ensure you don’t supersaturate the whisky. Adding water will allow the whisky to open up even more. You’ll find it releases many notes that may have been faint or buried. Now repeat the earlier steps we just discussed. Even if at first you struggle to pull out individual notes…just sit back and inhale. If you enjoy the flavor of your dram, I guarantee you’ll enjoy the aroma even more. As mentioned above, the sensory load your nose can process, versus that which your palate can discern, will amaze you. There are now nosing kits available on the market. Use these as a guide. This is a great start. One last tip…try to do this exercise with more than one whisky at a time. Ideally whiskies of different regions, different casks, different ages and different strengths. This way you will have something to compare against. Always start with the lightest whisky and work your way to the heavier [maybe those with a higher abv (alcohol by volume) or something peated]. Let’s face it…most of us drink for pleasure, not for a paycheck. So even though you may read long-winded tasting/nosing notes from professionals (or amateurs like us) you need to realize that we are all starting with the same tool. Very few people have olfactory advantages. Most of us have common senses of smell. The key is to simply familiarize yourself with what you are smelling and learn to appreciate why it works…or doesn’t. Please can u guide …how can i be able or could u please send me a supper link of NOSING KIT. You can try http://www.whiskyglass.ca/. Otherwise, just Google search until you find a distributor close by.